We buried my mother’s ashes on a Monday in June. Fifteen members of her extended family stood around the grave. Everyone said something about her, or sang something, and then the groundskeeper set the urn in the grave and everyone dropped in a shovelful of soil. Rain threatened, but didn’t really start under the grave was covered. We went to lunch, and I went back to my hotel. It was 2:30 and I felt like going to bed. I knew that was a bad idea, so I went to the movies instead. My mother’s favorite theatre was two blocks from the hotel. It’s an old theatre, the kind that doesn’t have its own parking lot. You stand on the sidewalk, pick a movie off the marquis, and walk in. There are two screening rooms. One was showing something serious with subtitles, which I really wasn’t up for. Instead I chose the Pixar cartoon Inside Out. I’d seen many movies at this theatre with my mother. We’d sit next to each other and share a box of chocolate covered peanuts. Today I ate the peanuts and sat next to an empty chair. After a scuffle in the control room, Joy and Sadness get lost in the memory banks, leaving Fear, Disgust, and Anger in charge. Over a couple of days, Riley grows moody and distant, fights with her parents, sneaks out of the house, and boards a bus back to Minnesota. While Riley is on the bus, Joy, rooting through Riley’s memory banks, discovers that Sadness does have a purpose after all: it alerts others when Riley needs help. Joy puts Sadness in charge, and soon Riley gets off the bus and returns home, where she cries to her parents, who start to give her the attention and comfort she needs. It’s a fantastic movie, the best I’ve seen in many years. When I chose to watch a cartoon after my mother’s burial, I wasn’t looking for something quite so intense, but actually my mother, a psychotherapist, would have loved it. Its plot could have been inspired by one of her favorite psychology books, The Secret Strength of Depression. Martin Kingfisher moves me to tears. I didn’t know he sneaked off to the movies. I loved that movie, too. I thought the language was for psychologists, but the kids totally get it. 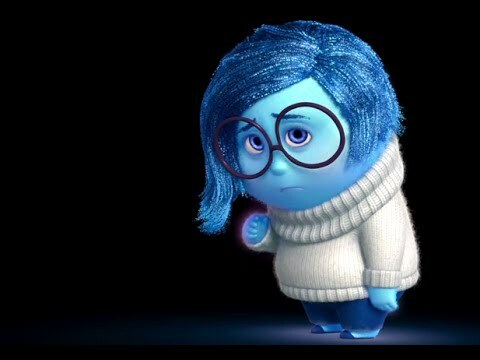 My little 5-yr.-old grandson asked me, when I questioned him about the movie, “Do you believe in sadness, Grandma?”.